Glass « Global Market Insights, Inc.
Powered by the rising concerns with regard to environmental degradability, global automotive composites market has gained a remarkable momentum over the recent years. The problem of exponentially increasing carbon dioxide emissions has been recognized as a matter of concern at a global level, in response to which, both the government as well as private entities are striving hard to combat this issue. Citing an instance with the regulatory frame of reference, The European Union (EU) has introduced norms that aim to limit the CO2 emission per vehicle to 95g/km by 2020. Reportedly, as of now, each vehicle in Europe emits approximately 133.3g/km of carbon dioxide. Yet another initiative being widely undertaken to curtail these emissions revolves around reducing the overall weight of the vehicles, subject to the fact that the lightweight automobiles depot a high fuel efficiency and a considerably lower rate of emission. 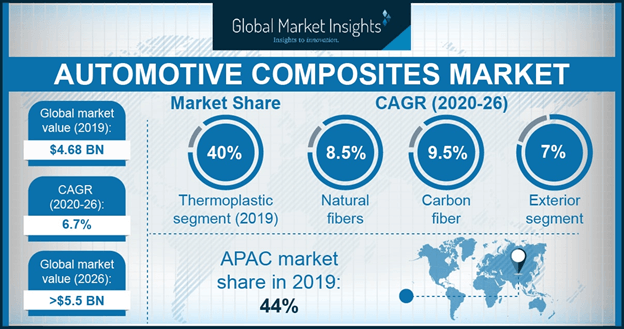 The aforementioned fact can be validated by the recent trend of lightweight material adoption in the automotive sector spanning across the interior as well as exterior designs of the vehicles, that has led to a major revolution of sorts in automotive composites industry. 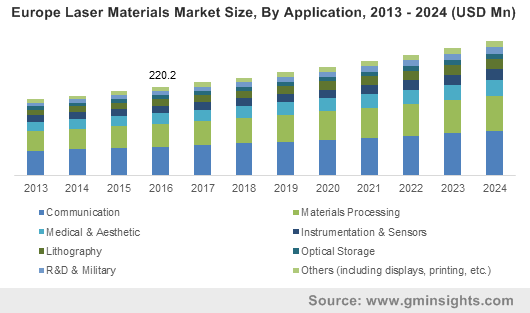 The demand for composite materials is expected to rise several notches higher in the years to come, on the grounds of which various educational research institutes and renowned players of the automotive composites market have been working diligently toward the development of novel composite materials through innovative technology. For instance, the British automotive composites industry player, McLaren Automotive, has recently constructed the McLaren Composites Technology Centre (MCTC) worth GBP 50 million, at Sheffield in UK, wherein the company plans to manufacture lightweight carbon fiber with advanced manufacturing processes. MCTC is also expected to commence the production of carbon fiber tubs for its automotive wings including supercars, sports and racing cars by 2019, further impelling the regional automotive composites market share. The UK government seems to be keenly encouraging education hubs to develop trained composite engineers and scientists in a bid to tackle any future challenges that might arise ahead, with regards to composite materials, that is certain to impel the regional automotive composites industry. Say for instance, the Higher Education Funding Council for England (HEFCE) has granted a fund of GBP 200,000 to the joint projects of the University of Bristol and the University of Plymouth to carry out research related to composite materials. This precedence indeed validates that the increasing involvement of research institutes and industry giants toward enhancing the product portfolio of this business space will stimulate UK automotive composites market size. Currently, it has been observed that numerous governmental bodies, at the regional as well as international level, have been focusing on the deployment of renewable energy sources for overcoming the shortage of fossil fuel sources – a trend that is predicted to influence automotive components market. The prevalence of a strict regulatory frame of reference mandating specific norms encouraging the adoption of renewable resources will further enable the masses to incline toward electric vehicles. 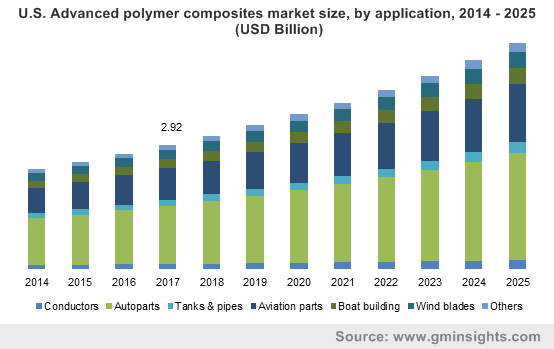 In consequence, this would increase the dependency on renewable energy sources in the future, which seems to be one of the pivotal strategies of the government to expedite the growth of automotive composites industry. 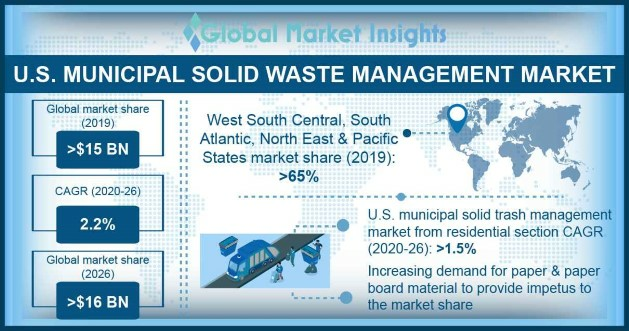 In essence, the shifting trends toward green mobility and the elimination of carbon emissions are certain to have a considerable impact on automotive composites market outlook in the ensuing years. This entry was posted in Automotive & Transportation and tagged Automotive Composites Market, Automotive Composites Market Analysis, Automotive Composites Market Forecast, Automotive Composites Market Report, Automotive Composites Market Share, Automotive Composites Market Size, Automotive Composites Market Study, Automotive Composites Market Trends, Carbon, Compression, Exterior, Fiber, Glass, Global Automotive Composites Market, Injection, Interior, Natural, Powertrain, Resin, Resin Transfer Moulding, Structural, Thermoplastic, Thermoset. The profitability quotient of Indian doors market is certain to escalate in the coming years, augmented by the thriving construction sector across the country. Driven by a plethora of factors such as growing Indian population demanding comfortable lifestyles, increasing public and private spending on refurbishment & construction activities, and encouraging governmental initiations toward infrastructural development, Indian doors industry size is expected to widen its horizon in the forthcoming years. In fact, estimates claim, private equity sector investment in real estate in India was over USD 6 billion in 2016. As per a recent report put forth by IBEF (India Brand Equity Foundation), Indian real estate market is slated to record a massive valuation of USD 180 billion by 2020, another testament deemed to stimulate Indian doors industry trends in the coming years. Over the past few years, there has been a significant transformation in consumers’ buying preferences with regards to artistic and aesthetics quotient, a factor that has brought innumerable innovations in door quality and texture. In this regard, it is prudent to mention that uPVC doors are creating a storm in the Indian doors industry, subject to their unique advantages such as better insulation, energy efficiency, thermal insulation, diversified color options, and minimum maintenance requirement. 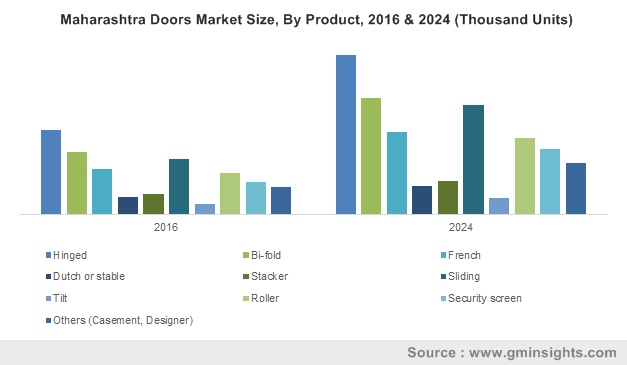 In fact, uPVC Indian doors market is expected to witness a y-o-y growth of 8% over 2017-2024. In addition to this, leading giants of Indian doors market are also investing in enhancing their product portfolio that not only claims technological incorporations but also are environmentally viable. KONE is considered as one of the forerunners in bringing eco-friendly to the Indian doors industry. The company offers a full range of industrial doors, loading bays, barriers, shutters for commercial and residential housing complexes. Reliable operation, durability, safety, and most importantly environmental competencies are some of the fortes that make KONE a renowned player in the Indian doors market. Some of the other renowned players in this space include Fenesta Building Systems, DORMA, Century, D. S. India, Duroplast Extrusions, Geeta Aluminum Company, Beautex, Kalco Alu-systems, Mahavir Aluminum, Sapa Building System, Reynaers Aluminum and Welltech Systems. Speaking of geographical aspects, West Bengal, Delhi, and Maharashtra are some of the states where the industry observes quite profound growth. In fact, estimates claim that Maharashtra alone accounted for 12% of the overall Indian doors market share, having held a revenue of USD 180 million in the year 2016. Strong pipeline of construction projects across residential, commercial, as well as industrial sectors has propelled the product demand in Maharashtra. A crucial determinant that needs to be mentioned here- the state is the second most populous region of the country, a factor that has enabled it to be strong contributor toward the overall Indian doors industry share. Another statistic that can be placed as a testament regarding the increasing refurbishment and maintenance activities in Maharashtra- as per the National population and housing survey of 2011, out of 3.36 crore registered houses in India, 2.98 crore were in Maharashtra. Taking into account these aforementioned aspects, Maharashtra is expected to continue to stand as a strong contender in the Indian doors market. 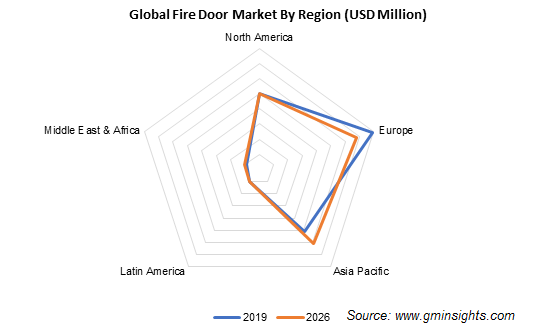 With the escalating construction space along and supportive government initiations toward manufacturing eco-friendly, fire resistant, weather proof doors for commercial and residential sectors, it is certain that Indian doors industry is all set to carve a lucrative path in the years ahead. Experts believes that in the coming period, the business space will witness an influx of even more sustainable energy efficient doors. Having held a valuation of USD 1.2 billion in 2016, Global Market Insights Inc., forecasts Indian doors market size to exceed USD 2,800 million by 2024. This entry was posted in HVAC and Construction and tagged Aluminum, Bi-fold, Commercial, Doors Market in India, Dutch or stable, French, Glass, Hinged, Indian Doors Market, Indian Doors Market Forecast, Indian Doors Market Growth, Indian Doors Market Size, Residential, Roller, Security Screen, Sliding, Stacker, Steel, Tilt, uPVC, Wood, WPC.